World leaders must not allow concern for energy security to distract them from taking promised action on global warming, top world scientists said today. Climate change solutions agreed at the G8 summit in Scotland a year ago risked being pushed off the agenda at next month's G8 summit in Russia by worries about security of energy supply, they said. Bollywood megastar Amitabh Bachchan today said Indian movies have finally got the dignity and respect they deserve overseas. US State Departments nonimmigrant visa chief Sally Ironfield has said Indian students can apply for US visa 120 days before the start of the course. Thai police has arrested two men from Hong Kong and India at the Bangkok airport for trying to smuggle 1.6 kg of heroin to the Chinese city, officers said today. One hundred persons are reported dead in a suspected outbreak of pneumonic plague in the east of the Democratic Republic of Congo, the World Health Organisation (WHO) said today. ''One year on from the UK Gleneagles Summit, where the G8 committed to taking action on climate change, this crucial issue must not be allowed to fall by the wayside,'' said Martin Rees, president of the UK's Royal Society. ''The G8 must demonstrate that this was a serious pledge by integrating climate concerns with their discussions regarding security of supply,'' he said. US President George W. Bush, who signed the Gleneagles declaration but has not ratified the Kyoto Protocol on tackling human-caused global warming by cutting carbon dioxide emissions, has called for reduced the US dependence on imported oil. Partly as a result of energy security worries there has been a surge in interest in nuclear power and coal as power sources. Kicking off the seventh International Indian Film Academy (IIFA) Weekend here, Mr Bachchan, who is the brand ambassador of the annual event held outside Indian shores, said Indian films were receiving overwhelming response from people cutting across nationalities who enjoyed the Indian films. ‘’The West was earlier cynical about our movies. They were an object of ridicule for the songs and dances. But today they (west) not only enjoy the songs and dances but also the story characters,’’ he said. 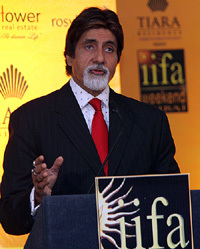 Mr Bachchan noted that IIFA has been appreciated by the host countries ever since it was launched. It is for the first time that prominent film personalities from South India like Mamooty, Mohanlal, Vikram, Prabhu, Meera Jasmine, among others, are attending the IIFA weekend. The IIFA weekend began with the IIFA world premiere of Jagmohan Mundhra’s Provoked starring Aishwarya Rai, Naveen Andrews and Nandita Das. The two day FICCI-IIFA Global business forum to promote bilateral business will be held at the Dubai Chamber of Commerce and Industry. Mr Bachchan will inaugurate the three-day film festival tomorrow. The festival will open with hit Tamil film “Chandramukhi’’ and includes 31 critically and commercially acclaimed films in all languages. In a State Department-hosted webchat yesterday she said, ''The official period prior to studies in the United States in which a student may apply for a visa is 120 days, and that the visa office in New Delhi is currently accommodating all requests for student visa interviews within three weeks.'' Post September 11 attacks, there was a sharp decline in the number of student visa applications and visa procedures too were made stringent. ''We are now on an upswing and on track to outpace last years number of 18,000 student visas issued,'' she said. India has been the leading country of origin for international students in the United States for the fourth consecutive year. Ms Ironfield said there is no Congressionally mandated limit for issuance of student visas and added that majority of the student visa applications from India are approved. Chung Cheung Panny Pau 43, of Hong Kong and Indian Daljeet Singh Dhaliwal 25, were arrested late yesterday, said Immigration Commissioner, police Lieut- General Suwat Thamrongsrisakul. It said 19 of the deaths were around the northeast Ituri district, which is known to be the most active area of human plague in the world with 1,000 cases each year. Some cases of bubonic plague had also been reported, the UN health agency added, but there were no figures.